Love this mastering plug in because even when you're not quite a pro (but even better if so) you will ne able to put some punch to your mix and bring some details to the stereofield. Play with the "sound" knob and change the upper frequency band to bring in crisp or determinate too much highs with lowering the lvl. Only a few things you can change - nothing more is needed most of the time (I confess to use the precision multiband in the mastering chain too). dial it in, and you get a rough punch to get happy non tech label people. I needed a mastering plug-in, so I can set better volumes on my recordings. This simple plug-in was more than i've been looking for. I love the stereo enchancer option. And it delivers a good sound for your demos. 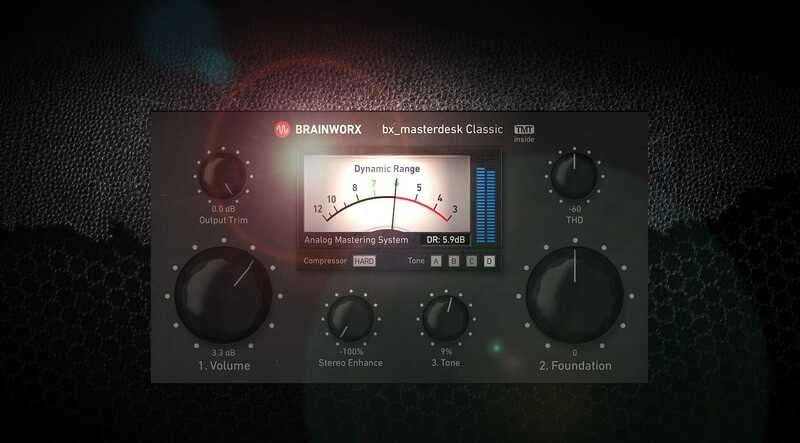 The bx-masterdesk Classic is a very good Tool for Mastering my Mixes for a first audition with my clients. This plugin is pure gold. I'm no mastering expert by any stretch (which is why I need a plugin like this one in the first place), but this just sounds so much better than Ozone on my mixes. Way more transparent while being louder at the same time. Good stuff! An amazing plug-ing for mastering. Simple and easy!!!! An Einfachheit kaum zu überbieten!!! Genial für schnelle und zeitsparende Mixes! This plugin is superb, simple and easy to uses. It adds depth, width and warmth to everything with a few twist and turns. Get it a be amazed at how things turn out. UAD and Bx collab! Easy to use Plugin in the Masterbus. Setup is a breeze with the help of the dynamic range meter. Good to dial in a powerful sound real quick. Fast and easy tweaks for a master without big knowledge. I'm not a pro, but I wanna to give a little push to my pre production or my home recording. This is perfect. So far the best plugin I ever tried. Really enjoy the quick way to use it and the result it cool. Have to try and I buy. thanks UAD for giving me a big discount for this one. I got it free and I tried it on one of my older mastered tracks and had instantly better results. This plugin is not like magic it IS magical. For quality speed mastering of demos I don’t think it has a peer. Optimum volume attainment with free feeling (spacious) limiting. Uncanny stereo placement and with subtle incremental changes this is now my go to tool. Brilliant! Me encanto la calidad que tiene el plugin !